At the time when the fishing world had limited understanding on how cold fronts affected bass, early views were inaccurately hypothesized to pretty much that cold front equates to tough fishing. In fact, cold fronts became a platitude vindication of bass anglers for not catching fish. Fortunately, blessed with decades of observation and experience, anglers had developed better understanding that would dispel some of the myths of cold fronts. In this latest installment, let’s talk about summer cold fronts from an urban fishing perspective. It does not really matter where you fish, cold fronts are cold fronts and they have negative effects on fish behavior. Though I am not a big fan of summer frontal conditions per se, a bad summer cold front can have longer impact on fish and presents different challenges. If you predominantly fish urban ponds like I do, you may agree with some of my opinions here. Pic. 1. A fishy looking retention pond with next to no cover in it. A cold front is a weathering phenomenon defined as the leading edge of a cooler mass of air replacing at ground level a warmer mass of air. Cold fronts occur all year long. When a cold front moves through a body of water, the air in contact with the water's surface causes rapid temperature drop, creating a thermal gradient in the water table. The shallower parts are cooler and it is gradually warmer in greater depths. The passing of the front often sends feeding bass to nebulous secret locations often called sanctuaries. Many theories exist as to why bass do this, but it is believed more moderate water temperatures exist there. Pic. 2. A solid urban pond bass. This momentarily suspended fish was caught on a 3/8oz football head jig (by NorthStar Custom Baits) with 4-inch Yo Mama trailer. Fish deeper water – Bass move to deeper water sanctuaries. Find those key migration routes from their usual feeding zones. Depth is a relative term. Sometimes, 4 feet is considered deep water in those predominantly shallow urban ponds. Fish smaller baits – Bass feed less, so offer them downsized bait. 1/4oz jigs or 4-inch Senko are some of the most reliable baits for postfrontal conditions in urban ponds. Fish tight cover – Bass hold tight to cover and its strike zone is considerably reduced. Flip or pitch small baits with light lines and fish up-close to structure. Slow down – Bass are less likely to chase, so fish slower. Weightless soft plastic baits will enable you to tempt more bites in shallow urban ponds. Pic. 3. Close-up view of the bait and tackle. This looks like a prespawn bass to me. Though this is not a one size fits all proposition in any case, adhering to the above enables you to tempt more reluctant bites, rather than trigger aggressive strikes. This approach works in manmade shallow urban ponds with less dramatic changes in underwater environment. During the lavish weed growth conditions of summer, postfrontal conditions sends bass retreating to the nearest, deepest possible dense cover. But, this principle does not always apply to bass in ponds. 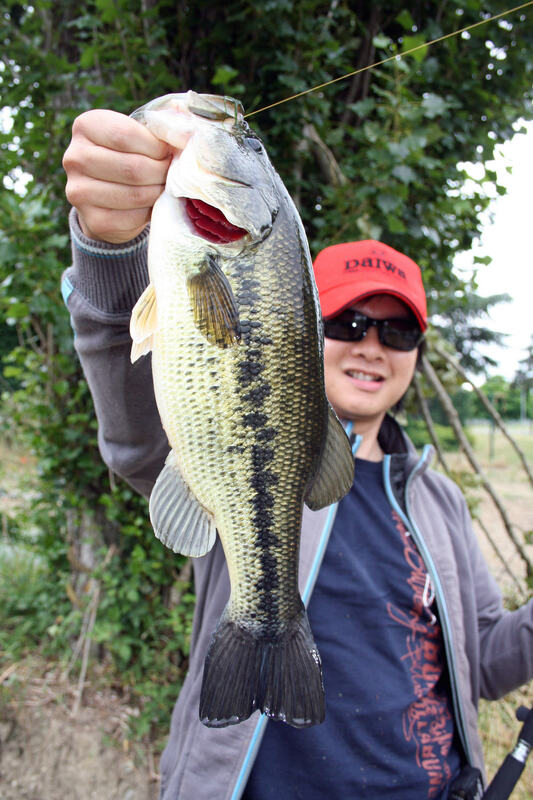 In Toulouse and its suburbs, I predominantly fished ponds which were either milfoil infested or muddy, open water. These are two of the most extreme conditions. 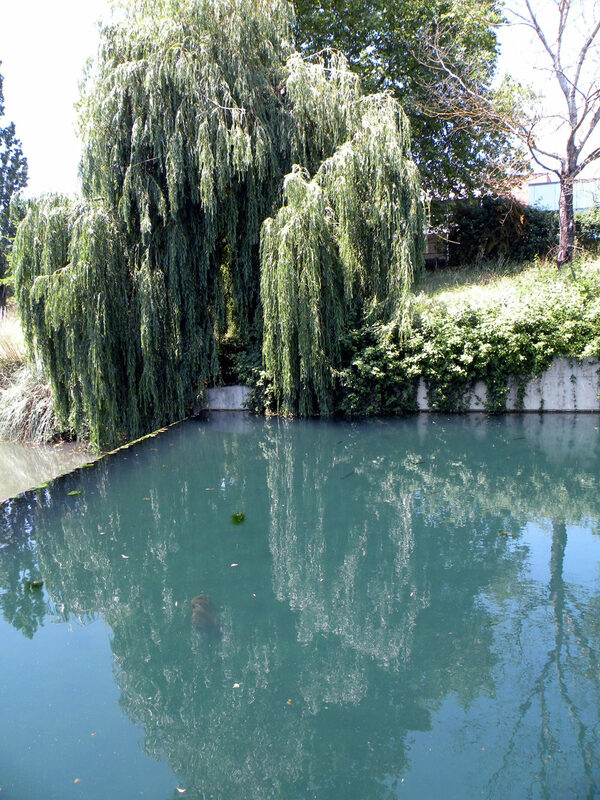 Moreover, most urban ponds that I have encountered are manmade and do not vary greatly in depth. As you could probably imagine, compared to vast fisheries in the States, conditions in Toulouse are nowhere as varied. Despite that, bass fishing in urban ponds is not always a walk in the park, especially under summer postfrontal conditions. Pic. 4. Another solid fish! I caught this fish on a wacky rigged 4-inch Senko on 6lb test Sufix Siege monofilament in clear water. My basic game plan for adapting to summer frontal conditions is quite simple. 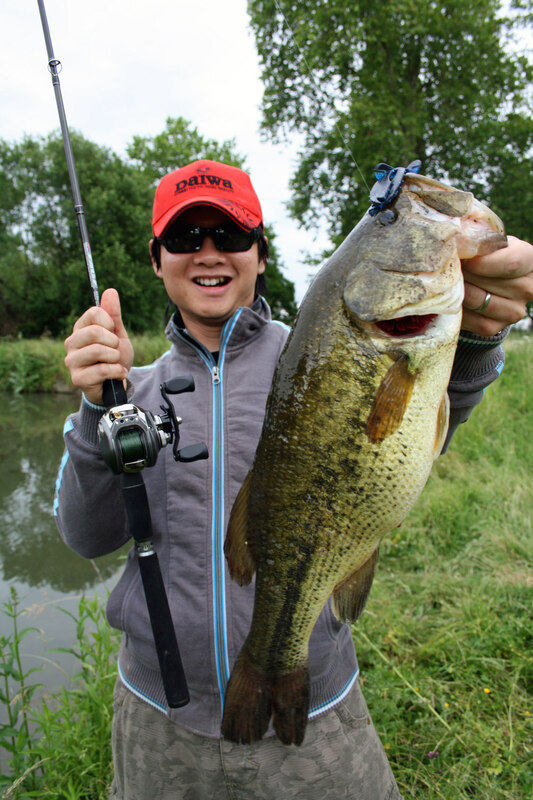 During postfrontal conditions, bass reduce their activity and hunker in weed or other forms of cover. If cover is absent, usually in muddy ponds, bass retreat to slightly deeper water and they become less eager to react to fast moving baits. If you have a good idea where they retreat to, you can patiently work potential areas with slow moving baits such as jigs, Texas-rigged soft plastics and sinking soft stickbaits such as Senko. Downsized baits, such as 1/4oz jigs with short trailer or 4-inch Senko, fished with light lines will no doubt produce more bites. To effectively locate bass in either milfoil infested or muddy ponds with very little or no visible cover, you will have to cover water and fine comb potential areas. Bass in small ponds tend to stay in small groups under postfrontal conditions. This allows you to focus your efforts on presentation that will entice them to bite. However, conditions in most shallow ponds do not always present anglers with opportunities to catch multiple fish from these small groups of fish. Besides covering water, always keep an eye on those momentarily suspended fish. Though suspended bass may be easy to spot in shallow ponds, they do not usually hold their position for long at any one instance. To catch these fish, you will have to react quickly before the fish goes out of your sight. To sight fish more effectively in such conditions, quality polarized sunglasses with contrast enhancing lenses would give you some added advantages. All in all, summer cold front fishing in urban ponds is not necessarily tough but it sure is different. In order to put yourself in the game, you must adjust your tactics and thinking to adapt to what bass are doing under postfrontal conditions in summer. Until the next time, fish hard, fish well and god bless. I would like to thank Bill Siemantel and theBBZ for giving me this opportunity to present to you this short feature on urban bass fishing in Toulouse, France.